Come March 2019, BlogWalker turns 13. I’ve loved being part of the Edublogs’ global community, a vibrant, ongoing source of inspiration and learning. I have experienced first-hand the unlimited possibilities and benefits blogging offers for being an active, contributing digital citizen. I was blogging before Twitter came into my life. Through an RSS feed, I received alerts when my favorite bloggers (i.e., Kevin Hodgson, Bud Hunt, Troy Hicks, Will Richardson, Monica Edinger, Joyce Valenza, and more) posted a new piece. At some point, Twitter replaced my RSS feed, so today it will likely be a Tweet that directs me to a post from Kevin, Bud, Troy, Will, Monica, and/or Joyce. In 2006, it was important to me that others were reading my blog. While I still very much enjoy having a reader drop by BlogWalker and leave a comment, today Twitter is where I mainly connect and interact with other like-minded educators. 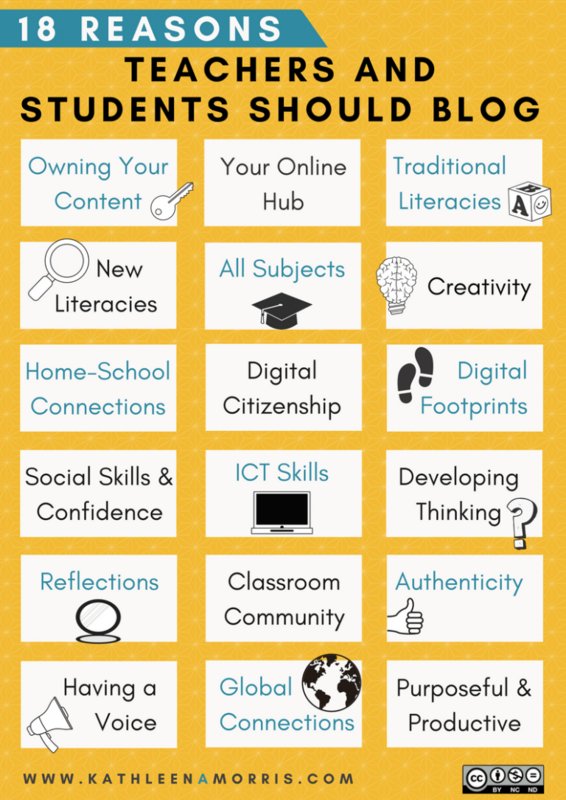 But blogging still serves an increasingly essential role in my learning journey. BlogWalker is where I document and reflect on my learning. It’s my digital file cabinet. I love that I can put ISTE or CUE in my search bar, for instance, and read through sessions I attended and favorite takeaways going back over 10 years. Eight years ago, I had no idea how many other teachers would appreciate that I shared resources and strategies for passing the CTEL test. And my 2016 trip to Rwanda – love that Carl Wilkens has used that post as a window into what educators will experience on his life-changing tours. When I do blogging workshops for my district, I introduce Edublogs as a tool for both teachers and students. I am passionate about every student graduating with a positive digital footprint and an ePortfolio. I love George Couros’ strong recommendation for students to use Google as their working portfolios, which they regularly curate, selecting pieces for their professional ePortfolios/blogs. He too loves the flexibility of CampusPress/Edublogs, which allow students to upload/embed multiple platforms (YouTube, Vimeo, etc. ), practice their digital citizenship skills (respectfully commenting, respecting intellectual property, etc.) and take their blogs with them – beyond graduation. Blogs are a simple, yet powerful, way for students to reach “redefinition” on the SAMR ladder, taking student voice beyond the confines of the classroom and providing an authentic, potentially global audience. 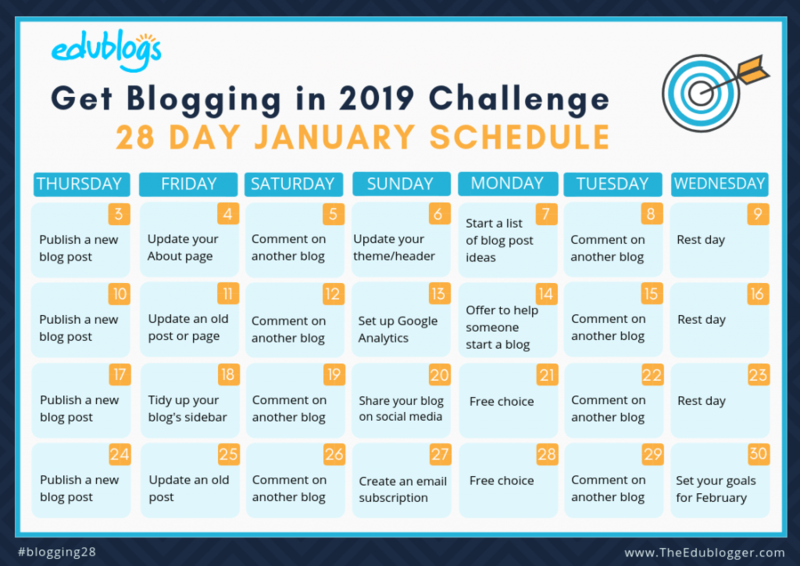 My 2019 resolution is to continue to promote and support blogging through offering workshops and participating in PLN-building opportunities such as the January Blogger’s Challenge. I hope you’ll join me! 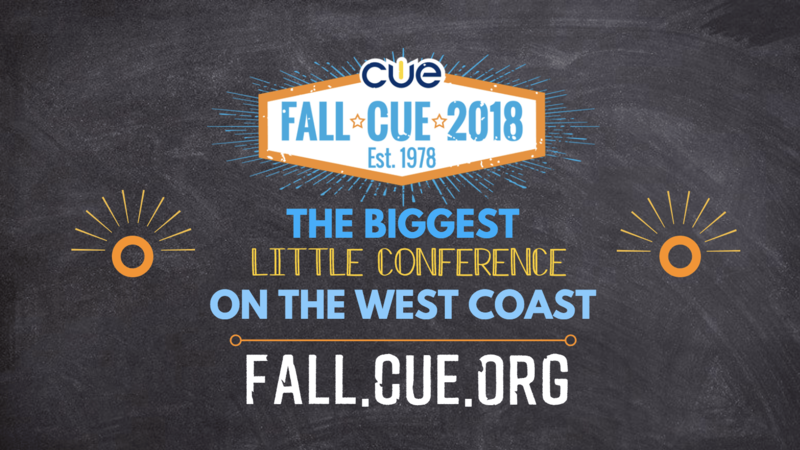 I just returned from a jam-packed weekend at the 2018 Fall CUE Conference in Napa (California’s wine country). The challenge at any CUE Conference is trying to decide which of the many enticing sessions I should attend. I think I made some great choices. 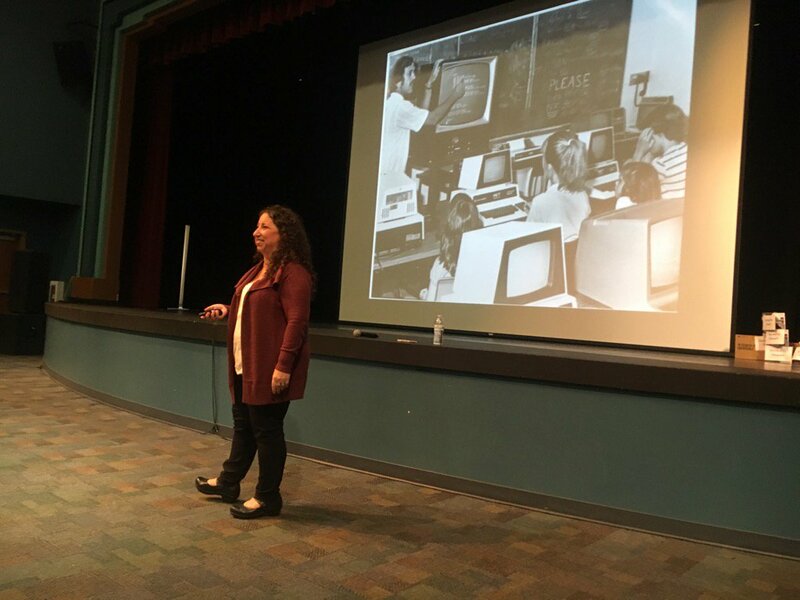 Empowering ELLs in the Google Age – I loved starting the conference with Abby Almerido‘s session. Although the focus was on ELLs, the speaking and listening activities were applicable to all students. If you check out her presentation, you can see that visual literacy – a must-have 21st century skill for all students – is at the heart of her work. View a fuzzy photo (slide 6), form an opinion, and provide 3 support statements as evidence. View 4 images (slide 7) and come up with a common theme to connect theme. Come up with a question that invokes some tension (slide 9). Consider the power of using moving images (slide 10). Such simple, yet powerful, strategies to not only build speaking and listening skills but to also scaffold students into writing activities. Loved all the shared conversations from this session! 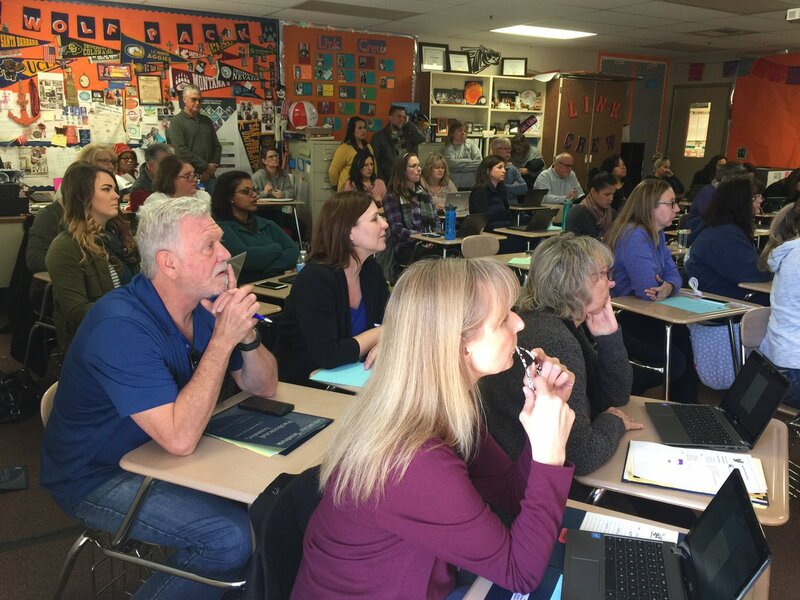 Painless Privacy: Empowering Educators to Safely Create Content – If you are a classroom teacher, I recommend that you go through the entire presentation from Calif. Dept of Ed’s Geoff Belleau and Elizabeth Wisnia. I know how frustrating it can be for teachers to start a lesson, only to find that a website they wanted students to use is now being blocked, sometimes for inappropriate content, but often for student privacy issues – another 21st must-have skill. Phishing and Whaling (slide 8) – “Whaling,” a new term for me, refers to scams that tackle organizations. “Ransomware,” which is usually generated based on click-bait, can quickly set off encryption all your personal data. A good reminder to back up your work! Teens & Social Media report (slide 16) – From Common Sense – If you are looking for resources for a Parent Night, this is a great resource. I like the video because it includes both negatives and positives of social media. Future Ready Schools (slide 18) – Kudos to the California Department of Education for developing the Future Ready Framework, a format for “thinking holistically about the challenges and possibilities of technology in K-12 spaces,” and sparking conversations on ways to enhance and maximize data privacy and technology efforts. I appreciated Geoff’s recommendation to not get overwhelmed by all 7 gears; instead, start off by choosing two gears to focus on. Framework implementation can be done at district and site levels. K-12 Cyber Incident Map (slide 19) – If you haven’t visited https://k12cybersecure.com/map/, this is a wake up call! The map includes “D Dos (Denial of Service) attacks” (red pins), which any teen can activate by paying a small fee to a 3rd party that is able to flood a school’s network and shut it down, for instance, so students will not have to take an online test scheduled for their next class period. Think Like A Cat (slide 22) – If you haven’t already seen Common Sense’s excellent videos on student privacy, head back up to slides 36-38. Then check out the Think Like a Cat video, part of a PBS series, that shows how news can be manipulated. Shorty Awards – The Best in Social Justice (slide 44) – Cannot wait to share out about this award, which “honors a program, project, or initiative that seeks to address and dismantle systemic structural and interpersonal inequities based on race, class, gender, sexual orientation, age, ability status and any intersection(s) thereof.” A great tie-in to digital citizenship initiatives! So glad I attended this session. Teaching students about the importance of protecting their online privacy is one of four themes my district focuses on for our #DigCit program. Love having all these resources in one place. Lunch Break with PORTS – Can’t think of a better way to spend a tech conference lunch break than with the California Parks Online Resources for Teachers and Students (PORTS) team. PORTS is one of my favorite resources for bringing California’s parks into the classroom virtually. 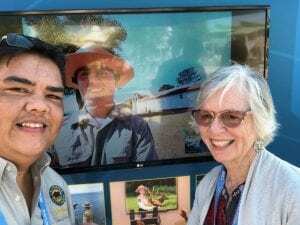 Although it’s a little hard to see the screen behind us in this photo, Ranger Ben Fenkell and I are connecting live with Ranger Parker at La Purísima Mission State Historic Park (near Santa Barbara). This California Mission videoconference is one of the latest offerings in the growing PORTS options for bringing grade-level appropriate history, geography, science, and architecture virtual field trips into your classrooms – for free. 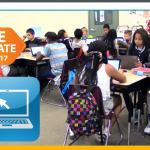 And, of course, I have to boast a little that the 3rd grade Gold Rush videoconference on the PORTS landing page features an amazing teacher from my district, Cathe Petuya, and her students. Ladder of Inference – I had not seen this infographic before. Scott explained how it illustrates the thinking process that we go through, consciously or unconsciously, to move from a fact to a decision or action. Search Tips: “It’s all about algorithms which reinforce our biases.” Part of stepping out of our “filter bubbles” is to recognize how our Google search returns are quite possibly reinforcing our biases. Thinking Critically About the (Fake) News – Here’s the link to our digital handout. If you weren’t at Fall CUE, but will be attending Spring CUE in Palm Springs, we’ll be doing both sessions there. Please join us or stop by to say hello. “Educating staff has to be part of the process of rolling out digital citizenship.” As co-director of my district’s digital citizenship program, I email and post regular updates to our school site #DigCit coordinators with new resources for them to use with students. With Nicole’s quote in mind, from now on, those emails will include tips and resources for site coordinators to include in staff meetings. Collaboration in Common – I learned about the CiC resource last May while attending Sacramento’s first Media & Information Literacy Summit. With support from California’s Department of Education, CiC “allows teachers to discover and share resources and to connect with educators from across the state in virtual communities focused on the topics that matter most for teaching and learning.” I #DigCitCommit to being a regular visitor and contributor to CiC, and look forward to connecting with and learning from other California educators around media literacy topics. I recently blogged about Nicole in my “Hacking” the Learning Standards post. 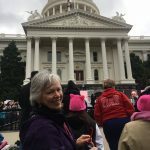 Given that she also lives in the Sacramento area and that our paths seem to be crossing on a regular basis, I am fortunate for the face-to-face opportunities to learn from her. The good news is that anyone, anywhere can learn from Nicole by visiting her blog 3 Rs 4 Teachers: Promoting Rich, Relevant and Rigorous Teaching and Learning. Sparknado – Ending my Fall CUE experience with Brandon Schut’s fast-paced, humor-infused session was a good call. Although the digital handout for his session is on a Google Site (one of my favorite tools), the session was all about Adobe Spark, Adobe’s fantastic tool for “transforming your ideas into stunning visual stories.” My big takeaway from this session was an advantage for students of Adobe Spark over Google Sites: the built-in image library includes the Creative Commons citations, which are automatically added when you embed an image. And the citations will also be listed at the bottom of a Spark page. Although Google Sites are automatically filtered to find images licensed as CC0 or Public Domain, which means attribution to the creator is not required, creators most likely appreciate the recognition – and you eliminate possible copyright questions your readers might have. Although you can track down attribution information on images found in a Google search or insert, having the credits already populated in accordance with Creative Commons’ recommendation for “ideal attribution” is a time saver. I think Greg Eiler’s Tweet and gif (below) will give you a bit of window into Brandon’s energy and dynamic presenting style. A huge thank you to the CUE staff for putting together an outstanding event. As you can see from my post, the Saturday/Sunday event was well worth the trip to Napa. Thank you also for providing delicious box lunches both days (along with a coffee stand/truck that even sold kombucha). 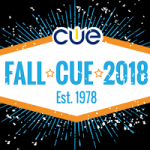 The lunch breaks were a perfect opportunity continue conversations sparked by the Fall CUE 2018 innovative presenters. 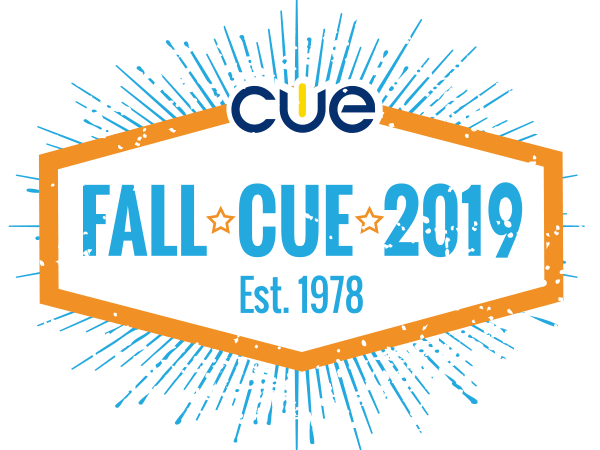 Apparently, it’s not to soon to start the countdown to Fall CUE 2019, as the logo is already being widely shared. See you there. I love the many ways teachers in my district – and probably your district too – are guiding student-centered conversations about building positive digital footprints, protecting online privacy, and confronting cyberbullying. A shout out to Common Sense Media, iKeepSafe, and Netsmartz for the wealth of free resources and lessons you provide to schools on these key digital citizenship topics. There is a fourth digital citizenship topic that many teachers are increasingly recognizing the need to address: intellectual property. By 5th grade, most students have been warned about the consequences of plagiarism, a conversation that is typically repeated throughout their middle and high school days. While plagiarism is certainly an important topic, in a digital age, copyright, fair use, and Creative Commons also need to be included in the conversations. 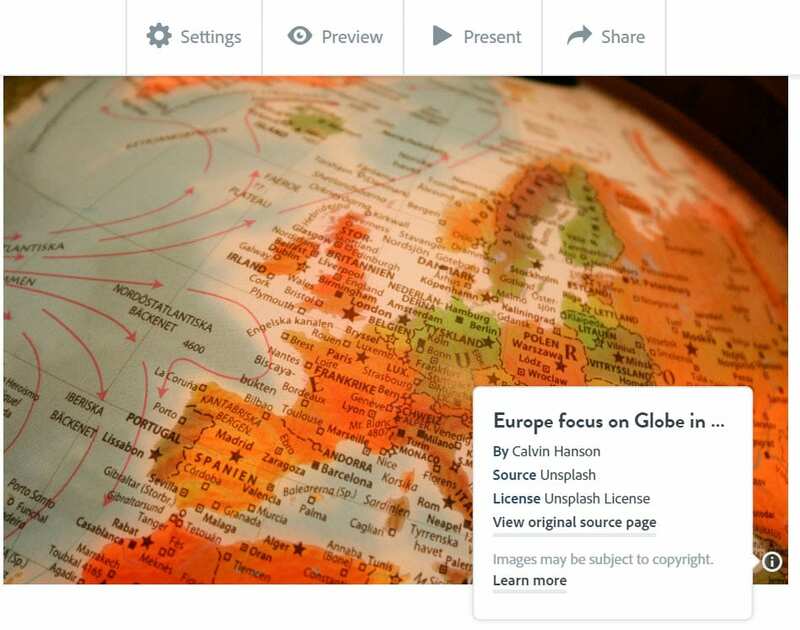 Given how easy it has become to download, copy, remix, and upload online content, students need to have an understanding of both their intellectual property rights and responsibilities. 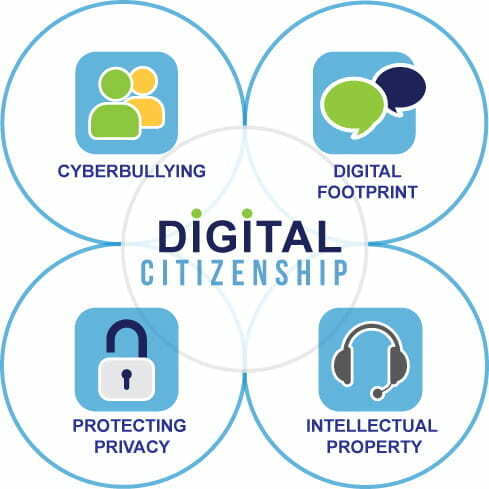 As a co-director of my district’s Digital Citizenship initiative and co-curator of the Digital ID project, I am always seeking teacher-friendly/student-friendly resources on intellectual property. I also facilitate district-wide and national workshops ( e.g., CUE and ISTE) to help teachers understand that copyright is different from plagiarism and that fair use and Creative Commons are also options for our students. Based on questions from workshop participants, two years ago I created Can I Use That? A Guide for Teaching about Creative Commons. I always review the guide prior to a workshop to check if I need to update any information or add new resources. This year, in preparation for the March CUE Conference, I’m adding a #HyperDocs* lesson that invites students to delve into copyright, flex their fair use muscles, and license their own creations via Creative Commons. So here it is: Can I Use That? Exploring Copyright, Fair Use, and Creative Commons. Hope you can join me and the fabulous Jane Lofton for our CUE Can I Use That? session (Saturday, 8:00)! If you have questions about the lesson or suggestions for updates to the Guide, please respond with a comment or contact me @GailDesler. *#HperDocs is a term invented by @LHighfill. I loved Saturday, January 21, 2017! Thanks to two events in the Sacramento region, I think I’ve stepped out of my post-election slump. 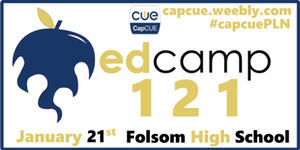 Event #1: EdCamp121 – Thank you CapCUE and Folsom High School for hosting Saturday’s EdCamp. From the moment I entered the multipurpose room, I could feel the combined energy of the awesome CapCUE team and the group of attending educators from across the Sacramento region, all looking forward to a day of sharing and learning about ways to enhance student learning and engagement through technology and best practices. Participants start the morning by jotting down whatever they would like to learn about on a post-it note and then posting their notes on a wall. The CapCUE team then sorts through the post-its and assigns the most requested topics to designated classrooms. The day’s program is then shared on a Google Doc. Here’s a link to Saturday’s EdCamp program. Participants head off to whatever sessions best suit their interests. Although there will be a room facilitator, there is not a main presenter. All are invited to share their knowledge and/or ask questions about the topic or tool. EdCamp Session 1 – I joined a group of teachers interested in discussing ways to use blogging and podcasting to promote student voice. Typical of EdCamp sessions, our group consisted of several teachers already very proficient with and excited about blogging tools, a number who had just started dabbling with blogs, and several who had not yet started their blogging journeys. All were also interested in learning more about podcasting with students. 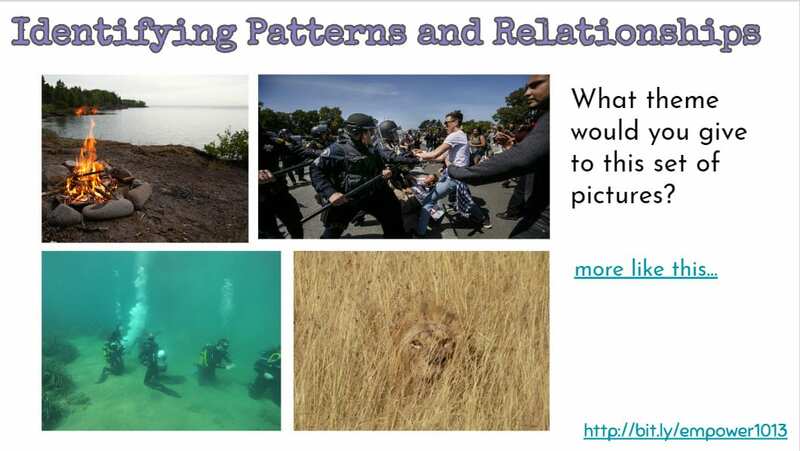 As a long-time blogger, I really enjoyed being part of this conversation and was able to share a few resources on the Padlet site (which the CapCUE team had set up for each session as an easy way for participants to share resources). Audacity – Like me, Ryan is also a big fan of Audacity, which allows you to easily edit your audio recording, add music, fade in/out, and then export and upload. Audacity is free and works across platforms. However, since you have to download the program, it’s not a good solution if your students are using Chromebooks. Spreaker – Has a “freemium” option. audioBoom – Here’s a review of audioBoom from Common Sense Media. Soundtrap – An easy way to create podcasts with accompaning music. TwistedWave – Will work on an iPad. Podomatic – Once you’ve created your podcast, you’ll need an online hosting service. Ryan recommends Podomatic. When you’re set up and have created a “show,” Podomatic will send you a .xml file, which allows you to tell iTunes each time you have a new podcast. Blogging and podcasting … oh the possibilities! 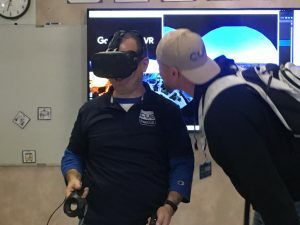 EdCamp Session 2 – I joined the Virtual Reality group. With the dynamic duo of Brian Briggs and Ryan O’Donnell as room facilitators, this session was mind-blowing! Be sure to visit the session Padlet to learn about the apps that were shared. I started dabbling a bit with virtual reality (VR) at the previous weekend’s EdTechTeam Summit by attending Jim Sill’s session on Google Cardboard Expeditions. So I was excited to learn about even more VR options. My plan is to little by little explore each of the sites and resources posted to the session Padlet. But, really, if I never venture further than Expeditions, I could already open the walls of the classroom exponentially. A few months ago, Larry Ferlazzo asked me to contribute to an EdWeek article on how to prepare students for field trips. I recommended that teachers incorporate videoconferencing in preparation for, or as follow up to, or even (due to school budget constraints) instead of a real time field trip. From the California State Parks PORTS program to NASA’s videoconferencing options, students can easily take virtual field trips to national and even international sites. No more permission slips, paying for transportation, hoping it won’t rain, etc. But if I could rewrite my article for Larry, I would be adding VR as a powerful follow-up to videoconferencing. I’ve been thinking about a teacher in my district who recently took his 5th graders on a virtual visit to Yosemite through a videoconference with our National Parks. The videoconference was an extension to a story the students had read about John Muir and Teddy Roosevelt. I think a teacher-led Google Expedition of Yosemite would be one more powerful way technology can open the walls of the classroom (especially in our Title 1 schools). Thank you again, EdCamp Team, for an engaging, energizing morning. 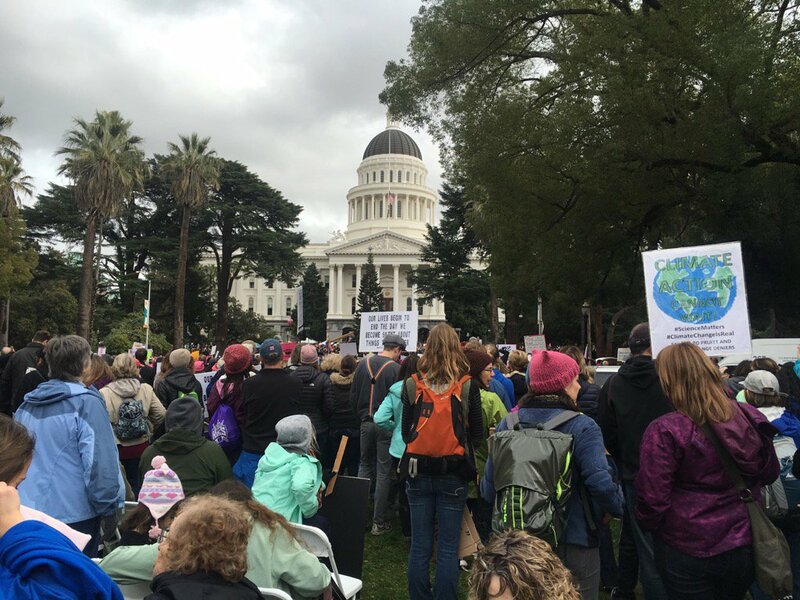 I apologize for not being able to stay for the afternoon – especially since you included a delicious lunch from Olive Garden as part of this FREE event – but I needed to get to downtown Sacramento for the 2nd event of my unforgettable Saturday …. Event #2 – Sacramento #WomensMarch – It will be a long time to come before I forget Sacramento’s #WomensMarch. To join 20,000 other marchers for this uplifting, unifying, inspiring event filled me with hope and a renewed commitment to hold our nation’s leaders accountable for their words and actions. Start to finish, I am grateful for every minute of January 21 and appreciate all who added to the day’s events in so many ways. It’s a substantial list of shared ideas, innovative thinking, and hopes and dreams for the future of our schools, communities, and nation. Writing in the Shed – Lisa Nowakowski shared a wonderful resource for English Language Development (ELD) students: The Literacy Shed, a collection of short video animations with no narration. Lisa has her students collaborate on developing a storyboard for what they think would be a logical dialogue. To narrate the videos, students use the record option available through SnagIt. What a great (and free) strategy to motivate students to put their language skills into practice! Teaching with YouTube – I first heard Lisa Highfill speak at the 2012 Google Teacher Academy (Mountain View, Calif), where she inspired all present with her integration of R.J. Palacio’s novel Wonder into her elementary classroom. I’m pretty sure all who attended her packed Fall CUE session left equally inspired with Lisa’s approach to YouTube video in the classroom: Find It, Playlist It, Pair It, Package It. Such a fabulous listing of videos to get students moving, thinking, doing! EX: Try pairing Daniel Cui, a soccer video, with a KQED DoNow question, What can you do to be a change maker? Key Principles for Digital Tools for EL Instruction: I regret that I arrived late to Martin Cisneros’ session (got caught up in conversations out in the quad). His knowledge and passion for teaching ELs left me wanting to delve deeper into the topic, starting with California’s ELD Standards (which do not replace the California Common Core Standards, but help with with meeting them). 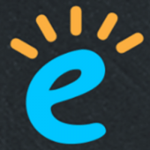 So how can technology help ELs gain proficiency in English? Social media provides opportunities to practice literacy skills. Google Translate is a great starting point for teachers to make connections with their EL students. Blabberize makes it easy for students to practice their speaking skills. It’s way less intimidating to have a character speak for you. Need instant curriculum for your ELs? Head to Pinterest! From Blog to Book: Rescuing the Writing Process’s Neglected Step, Publication – As a long-time blogger and supporter of student blogging, I was thrilled to see this session listed in the program. David Theriault and Sean Ziebarth are awesome presenters and an awesome team. In one very fun, fast-paced hour, they’ve inspired me to ramp up my district blogging workshops. Somehow, with all the focus on all things Google, I haven’t really been promoting blogging. Yet in all my Google workshops, I tend to start with the SAMR model as way to generate conversations on taking technology integration beyond “substitution” and “modification.” Blogging is often the tool that takes a project up the SAMR ladder to “redefinition” by providing students with a platform for publishing – to an authentic audience. The gap I need to help bridge is helping teachers move from blogs (noun) as a website for simply posting assignments to blogging (verb) as a shared conversation and step into publishing. I know in my upcoming blogging workshops, I’ll be referencing David’s post Shop Talk: The Nuts and Bolts of Student Blogging. It’s rare that I stay all the way through at a two-day conference to the closing keynote (I’ve usually reached the saturation point by 3:00), but I’m glad I made the exception to hear David Theriault’s keynote. I’m hoping CUE will post a link soon to the recording of his keynote as the slideshow below is not narrated. If you read the keynote description and then go through the slideshow, I think you’ll have an idea of how intriguing, fun, and thought-provoking David’s delivery and content both are. meaningful, memorable moments for your learners, and the world by stepping off the yellow brick road and diving into the deep sea of pedagogy. Steven Zissou, Harry Potter, Kenny Shopsin, Frederic Friedel, and Lynda Barry are just a few of the deep sea creatures we will meet on this adventure. Bring your wetsuit and diving equipment, no one is staying on the boat in this keynote. 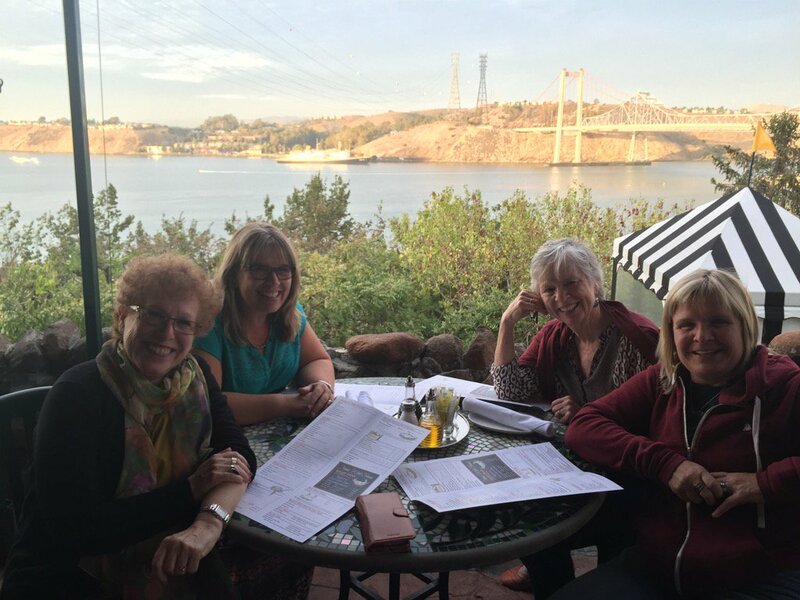 And one more great Fall CUE “session” – dinner at the Dead Fish Restaurant (just across the Benicia Bridge in Crockett) with Cathe Petuya, Mary Barelson, and Barbara Bray. Just returned from three fabulous days at CUE 2015. It was definitely worth the 10-hour drive (each way). Many thanks to Mike Lawrence and the CUE team for a well-organized, exciting event, start to finish. Below are a few of my take-aways. Can I Use That? Copyright & Fair Use for the Remix Generation – I loved the opportunity to co-present with California librarian extraordinaire Jane Lofton. I also loved our great audience. Thanks for kicking off the conference with our session! I will continue to add to the Can I Use That? A Guide to Creative Commons based on questions from you and your colleagues. Big take-away: I love how the Capistrano School District (Jeremy’s district) has built on and tweaked Long Beach’s CCSS K12 Technology Scope & Sequence Plan, starting with the title: (Draft) Digital Literacy in the K-12 Classroom. I agree with their statement that “This document provides a roadmap for teachers and administrators to adapt curriculum to ensure that students are building digital literacy competency as well as technological skills for college and career readiness and online assessment” and I applaud their K-12 vision (as opposed to separating elementary from secondary). Improving the iPad Workflow in a Google World – I’m a big fan of the awesome team of Karen Larsen and Gene Tognetti. With so many teachers looking for useful apps for their iPads, check out the presentation with its chart of apps and great SAMR illustration. 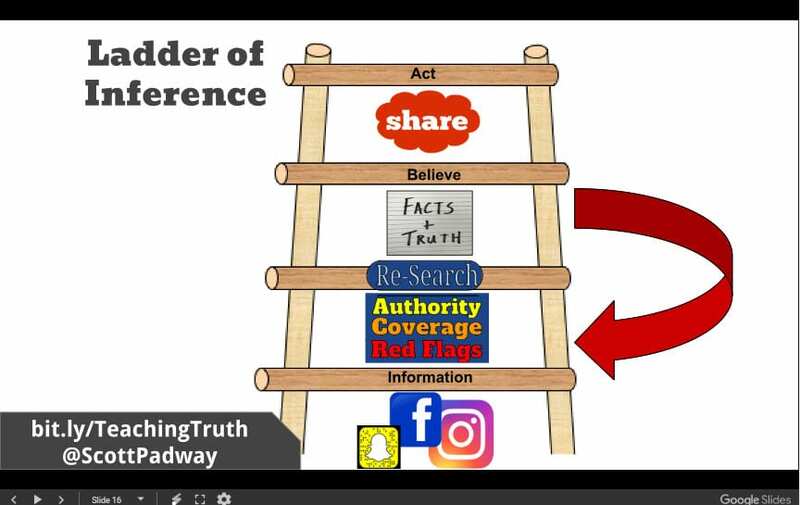 Teaching above the Line – OK, I didn’t actually make it to Pablo Diaz, Ann Kozma, and Holly Steele’s SAMR session, but, oh my, what a great resource their slideshow is. Thanks for sharing! Like Gene and Karen’s session (above), this team makes visible what “giving students a chance to develop their own voice and purpose in learning through SAMR” looks like. Jennie Magiera’s bring-down-the-house keynote – Wow! What an amazing kick-off to Friday morning’s events! I was fortunate to be in Jennie Magiera’s group during my 2012 Google Teacher Academy experience, so I already knew her keynote would be like no other. And, yes, that is California Superintendent of Ed Tom Torlakson dancing out in the audience. Google Certified Teacher’s Panel – A great session that definitely lived up to its description: “The latest and greatest tips, tricks and tools for Google Apps, and other Googly things.” Loved the energy and the excellent tutorials each of the presenter provided. I think you’ll want to checkout all 9 presenters. Biggest take-away for me would probably = Alice Chen’s Choose Your Own Adventure template for Google Slides, with the sample of introducing class rules via interactive slides, as opposed to teacher going over the rules. #PopBOMB – Creating 7 second videos that can change the world – Sorry that Matt did not include a link to his presentation. It was awesome. I heard Matt speak three years ago at Fall CUE and have ever since been a huge fan all of the options KQED offers teachers and students – starting with DoNow. SNL’s Mister Robinson’s Neighborhood – 10 years ago, this SNL series was a great sample of many to many model – incredible democratization of media (participatory culture alaHenry Jenkins). But you needed some media background and skills create these. Vader Sessions – Darth having nervous breakdown?! The tools for digitizing mashups are now readily available to all of us: democratization is powerful! Meme generator – meme (image macros) – download on phone. Choose from your photo library or take pic > name photo > add text top/bottom. Imgur – Love this one! Pick a meme image and add your message. Big take-away = Using Vine to create 7-second video that you can start and stop to make multiple cuts. Checkout the powerful juxtaposition of sweatshops and fashion juxtaposition in Matt’sine 7-second remix. Register as an educator. If there’s a $ sign, you only pay when you print – It’s the pic that might have the fee, not the template. So you can upload your own images – which you can then download for free. You have 24 hours to use download – or you pay again. Try combining Canva + LucidPress for brochures. LucidPress for K12 and higher ed = free. Google Cultural Institute – Historic Moments – Google gives you a template to use. You can upload your own. photofunia.com – Just plain fun. Upload a principal’s photo, for instance, and convert it to a historical figure. Again, a huge shoutout to Mike Lawrence and to all the great #CUE15 presenters for three amazing conference days! “We have to get away from standardizing to personalizing – in ways that celebrate diversity. Technology drives this revolution. Session 6 – Get slammed With Google – Loved the energy in this session! Definitely click on the link to see for yourself how Mark Hammons, Diane Main, Jen Roberts, Bill Selek (no live links yet), Scott Kley Contini, Joe Wood, Megan Ellis rocked the audience with their Google tips and tricks (AKA slams)! During my whirlwind 2 days at December’s Google Teacher Academy, Mark’s Google News Archive Search was my favorite “slam.” Judging from the post-CUE 2013 conversations on my flight home from Palm Springs, Mark once again wowed an audience. Grand Slam! Megan Ellis (a MERIT 11 colleague) shared a simple but very important Google tool: custom Google search engines. For educators like me, who teach tough topics, such as the Holocaust, Megan’s How To Tutorial is a gem, simply explaining how to create, for example, a Researching the Holocaust search engine with middle-school appropriate links. But seriously, you will want to check out each Google Slam demo! 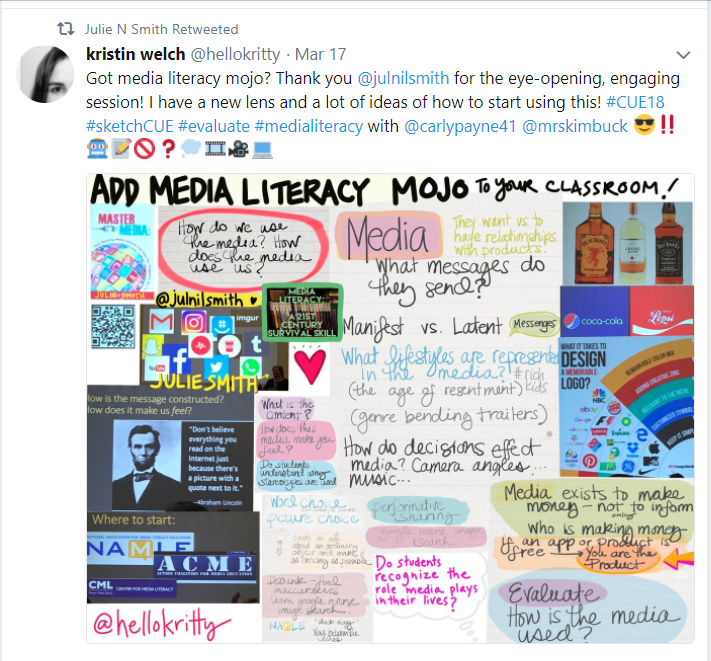 media literacy – what is the value of an image? How about music? Does if fit the narration? reflection – what did you learn? what would you change? What’s missing from my session summary are the powerful images and and stunning videos he used to illustrate each key element. For example, to show the difference between “digital storytelling” and “cinematic narrative,” he shared this BMX video and this stunning Inspired Bycycles video. If you missed Ken’s #cue13 session, but will be attending ISTE 2013, I’ll see you in his Making Movies with the iPad, iPhoneography, and Photoshop Basics session. I plan to arrive early! Session 8 – Explore, Flip, Apply: Empowering the Learning Cycle Through Technology – Although I caught only the tail end of Ramsey Musallam’s session (once again caught up in great #cue13 hallway conversations), having heard him present before (MERIT 11, CVCUE Fall 12), I wanted to end Day 2 with his winning style of brilliant + hilarious. I wasn’t disappointed. I think many teachers are put off by the idea of “flipping” instruction because they are concerned about putting hours and hours of time into creating instructional videos that students will be required to watch for homework, another form of lecture-based instruction, often limited to lower-order thinking. 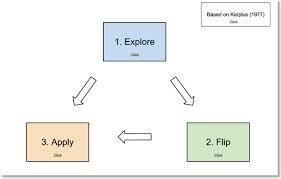 Ramsey’s approach to flipped instruction definitely taps into Bloom’s higher order thinking skills (applying, analyzing, evaluating, and creating). Using the Explore-Flip-Apply model, Ramsey has his AP Chemistry students explore a concept first. Then the “flip” comes in. Rather than introducing a concept with a video, he jumps in on the spot and creates “short, tailored video designed to address misconceptions and assimilation errors that arose during student exploration.” Rather than spending hours creating detailed screencasts, the “technology became a slave to the pedagogy, rather than vice versa, and the videos became, if you will, ‘inquiry spackle'” (quote from OnCUE, Spring 2013, Vol 35, No. 1). For tons more resources, strategies, and samples, visit Ramsey’s personal website and Cycle of Learning. Be back soon with Day 3 Take-Aways. I’m back from my first Fall CUE Conference. Two wonderful, jam packed days of connecting with colleagues and attending great sessions! The Personal Is Political: Remix and Fair Use – KQED’s Mathew Williams gave an awesome session on “learning opportunities for creating remix videos using found video footage online with an emphasis on fair use and critical thinking skills.” Mathew presented remix as as research method – and a critically important skill. It’s been a while since I last visited KQED’s website, but I plan to make time to explore their awesome Quest page. Designing Online Communities of Practice with Brokers of Expertise – I’m a huge fan of Brokers of Expertise (have even given a few BofE workshops), but couldn’t pass on an opportunity to hear Jon Knolle present. News flash: If you’d like to provide the California Department of Education and State Superintendent Torlakson’s Task Force with some feedback, here’s your chance, through Brokers, to share your vision for Education Technology in California Schools, share your vision for visual and performing arts and creative education in California Schools, and share your vision for STEM education in California schools. Prezi Primer – Christine Olmstead and Randy Kolset did a great job of touring the newest features of Prezi to both those familiar with or new to Prezi. I really like the greater variety of themes as well as the option to easily upload PowerPoints. KQED Do Now: Engage Students with Topical Issues Using Twitter – My second workshop with Mathew Williams was equally excellent. Check out the rich ways KQED’s Do Now program engages students with current issues using social media tools such as Twitter. I’ll definitely be including this site in my upcoming district Twitter workshop for administrators. 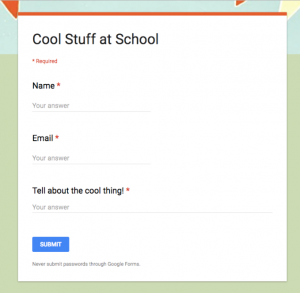 Feedback Machine: Using a Mail Merge with Google Spreadsheet for Student Communication – If you’re impressed by Flubaroo (as I am), then you will be in awe of how Alice Keeler takes instant online feedback to the next level with her Google spreadsheet tips and tricks. She’s posted the session links and tons of extras to her tech page. Licensed to Drive … Google Style – Loved Mark Hammon’s humor, injected throughout the hour. Glad to know that when inserting images to Google Drive, the citation is automatically included. Cool. Do You Flubaroo? How to Use the Auto-Grading Script Effectively – I’m pretty familiar with Flubaroo, but I really liked presenter Roni Habib’s suggestion to use it at the beginning of the school year to build online communities – and take it to a Wordle. Digital ID Project – My project co-creator/curator Natalie Bernasconi and I were at first a little bummed to see our session was scheduled at the end of the conference. That soon changed, thanks to the opportunity to spend our session with some pretty incredible teachers:-).